Although being unknown to most of the tv viewing audience, David "Chip" Reese is considered to be the best high stakes cash games player in the world. Especially his skill (in various games), mathematical approach and emotional control are a major factor in his success. David Edward "Chip" Reese was born the 28th of March, 1951 in Dayton, Ohio. Deceased December 4, 2007. During his first year in elementary school Chip suffered from rheumatic fever and had to stay at home for almost a year. His mother taught him several board and card games, including a variety of poker games. When he was six he played for baseball cards, and it didn´t take him long before he owned every card on the block. At high school he was a footballplayer and excelled on the debate team, where he won an Ohio State Championship and went to the National Finals. Chip spent his college years at Dartmouth College, after turning down an offer at Harvard University, where he was also accepted. In these years he won many games against fellow students and some of his professors. Upon graduating, he was accepted into the Stanford University Law Program. He intended to become a lawyer, but never made it to Stanford. The summer before he was to go to Stanford he took a trip to Vegas with Danny Robeson. He arrived there with $400 in his pocket and turned it into $40,000 by joining a Seven-Card Stud tournament at the Sahara. By the time he should have been at Stanford, Chip had a healthy bankroll of over $100,000 and Dany Robeson as playing partner. He once explained his decision to go into pro poker rather than law thusly: "Law doesn't have the same monetary incentive as poker." While playing $10/$20 stud, Chip saw some of the big-name players like Doyle Brunson and Johnny Moss playing hi-low split. "I was playing in my game but I was watching them and they were playing terribly." He called Danny and convinced him that the game was worth the risk of $15,000 of their bankroll, even though that would be a tiny buy-in for the $400/$800 stakes. He played from Thursday afternoon until Sunday night and won $360,000. From that time on Chip Reese was a regular in the big game. His score allowed him to start playing some hold'em, and Chip was happy to jump into games like ace-seven and razz even though he had never played them. He found himself broke several times, but his amazing ability to play almost any game allowed him to quickly build his bankroll again. Chip said about this time: "When I was younger I wasn't afraid to play anything. I figured that hey, if I don't know it I can learn it. I played no limit deuce to seven draw poker and all these other games I had never really played before because they were people I was beating in the other games, and I just figured I'd learn. And it was a tough learning curve: I paid a price when I was younger but now there isn't a game I can't play." When he was 40 Chip Reese became the youngest player ever inducted into the Poker Hall of Fame. Chip has some very good ideas about what counts most in poker. "What really separates top pros from good poker players is when things are going bad. It's like life. It's a long road that doesn't turn. It's how you handle the adversity in a poker game that matters.". Barry Greenstein has played many games against Chip over the years, and this is what he has to say about him: "I consider Chip to be the Jack Nicklaus of poker. He took on all comers for 30 years and won the most money. If an opponent is struggling, Chip will stay and gamble with him and make a big score. If Chip isn’t doing well, he will minimize his losses and may even put his ego aside and quit and wait for another day." 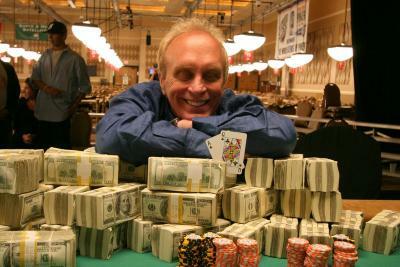 More recently Chip won the 2006 WSOP H.O.R.S.E. event, taking home $1,784,640, after a Buy-In of $50,000. Mike Sexton had this to say upon learning of Reese's untimely passing: "Chip Reese was probably the most successful poker player in history. He was also the youngest player ever inducted into the Poker Hall of Fame, and deservedly so. For years, most players considered Chip to be the best all-around poker player and by winning the inaugural $50,000 buy-in HORSE tournament at the 2006 WSOP, he cemented that status. Chip has always been admired by players for his success, his demeanor at the table, and that he never steamed or went on tilt." Sexton continued: "When you mention poker 'greats', put Chip Reese on the top of the list."